Home » Meet Our Staff » Our Providers » Tommy Ball, M.D. Dr. Ball was pleased to return to Virginia in 2001 to join FRFP after several years practice in central South Carolina. 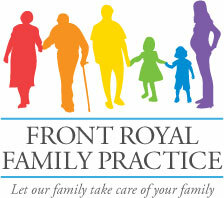 He strives to provide comprehensive family medical care. A former High School teacher, Dr. Ball emphasizes teaching patients to understand both disease and wellness. He and his wife, Christy Hartman, met in Front Royal. They have enjoyed becoming part of the community and renovating a small farmhouse in Browntown. When not in the office, Dr. Ball can often be found pedaling his bicycle along country roads or hiking with his dogs in the Shenandoah National Park.